Make sure your purse is one of a kind by commissioning your own custom colored scale maille purse. 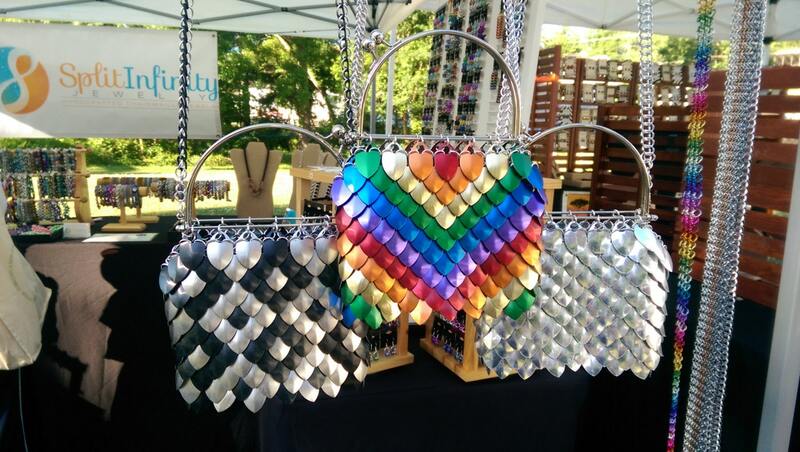 Based upon classical chainmaille design, this purse is created by weaving anodized aluminum scales together using anodized aluminum jump rings. The results are shiny, sturdy, gorgeous and distinctive. Make an impression and make your friends jealous while you're at it. The purse strap is removable, so you can choose to wear your purse as a shoulder bag, cross body bag, or just carry it by the charming half moon handle. The strap is also fully customizable and can be made in any chainmaille weave offered in our store in any color combination. The standard strap is 30" long in a Half Persian weave. Simply select your colors from Picture #5 and let us know any particular patterns you would like to incorporate. The finished purse will be the size pictured in Images #1, #2 and #3. The handle will be in the style of Images #2 and #3 in your choice of silver, gunmetal or antique gold (please select at check out). Purse size is 6" wide, about 8" long and will easily fit a phone, a small wallet, keys, and other small odds and ends. For shipping security, all purses will be sent via USPS 2 Day Priority. Purses will be insured. International customers, we will be happy to work with you on this purchase. Please contact me so we can generate a custom shipping quote based upon your location and desired delivery date.